I came across this book a couple of months ago through an article by Adam Brown on a website called DiaTribe. I’m signed up to their newsletter and regularly click in to have a read when they land in my inbox. In this case, the article that caught my attention was entitled “The Best and Worst Diabetes Food Advice I've Seen”. Definitely my kind of thing! Adam opens with that oft heard, well-meaning line, “You can eat whatever you want, as long as you take insulin for it.” This is a line I have often used myself and believed for a long time. But then, Adam said something that really struck a chord with me, as it took me a long time to realise and accept… this is possibly the most misleading diabetes food advice I have ever gotten. Theoretically, I CAN eat whatever I like, but in practice, despite my maths, my dual wave bolusing (insulin dose feature on an insulin pump that allows slow absorption of insulin), my clever little attempts to conquer the carbs, the fact is, the more carbs I eat, the less likely I am to have a good number. Which is very disheartening when you really are trying your best to get it right and you are certain that you got your sums spot on! Having read this article and realising there was a book expanding on Adam’s experiences as a person with Type 1, I had to download it. And I am so glad that I did. 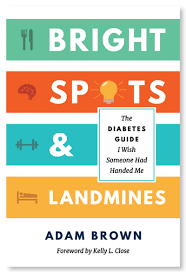 While I don’t think I could ever be as disciplined as Adam I certainly took some very helpful and insightful things from Bright Spots and Landmines. The book is split into 4 sections; Food, Mindset, Exercise, Sleep. I thought Food and Exercise were going to be the main areas of interest for me but, actually, I found Mindset and Sleep quite enlightening as well. In each section he looks at the Bright Spots; the positive behaviours and choices we make, the things we do right that we want to do more often, and the Landmines; the mistakes we make over and over again that affect not only our BG but our mood and life in general. In the Food section, something that stood out for me was how he opts for 30 grams of carbohydrates at one time. While I can’t say that I stick to this, there is no denying that when I have 30g of carbs per meal, the positive effect on my BG is there to see. So now, where possible, I do try to stick to 30g-40g of carbs per meal. I opt for more veg over potatoes, pasta or bread, berries and yogurt over a bar of chocolate. I still eat crisps and cake, don’t get me wrong, but I try to make choices that won’t lead me down the landmine path and potentially ruin my day! At least now when I make the 90g carb meal choice I am under no illusions what I am letting myself in for. In the Mindset section he speaks of our BG and trying to get yourself to think of your readings as just a number. It is information to make a decision. I think he describes it very well when he compares it to flying; “Would I trust a pilot using only three GPS readings over the course of a 15-hour flight? Or would I feel safer on a plane flown with GPS information updated every few minutes, plus trend arrows to guide safe flying? The plane’s current location is information to drive an action. Diabetes is no different! Frequent BG data points are my friend and help me navigate the daily diabetes journey safely: 1. Confirms the plane is flying smoothly; or 2. Shows the plane is NOT flying smoothly and a course correction is needed.” In the Exercise section, his suggestions on how to navigate the effect exercise can have on your BG, to avoid those highs and lows and the corrections that need to be made as a consequence, are practical and useful. He advocates doing exercise you find fun and look forward to, uncomplicated workout routines you can easily do at home so there are no barriers or excuses. In the Sleep section, he emphasises the importance of getting enough sleep, and quality sleep at that and the effect it can have on your BG. He discusses the night-time highs and lows that disrupt our sleep and offers some tips and tricks to keep these to a minimum. Overall, I found that everything Adam suggests is doable. There are no expensive gadgets or equipment required, no radical idea’s suggested, no upheaval to your life necessary. Yes, these are lifestyle changes and mindset changes, but they are achievable, they are easily done a little bit at a time and they do have positive results. I know I won’t ever manage to do everything that Adam does, but I also know that everything he has suggested makes sense, and there is a lot of it that I try to incorporate into my life and I can always refer back to his Bright Spots and Landmines to correct my course and navigate my journey safely when I need to. Diabetes is manageable, yes, but it’s tough, it's “my other full-time job”, and just like my regular full-time job, the more prepared I am, the better my day goes. You may decide that some of his suggestions aren’t for you, but I guarantee you will find something in this book to make you stop and think, something you can incorporate into your life to ultimately help reduce the number of landmines in your path and make the most of the bright spots. The book is available to download here for free but you can make a donation. I would; it’s totally worth a few euro!! *** Thank you so much Niamh for your review.